As a peculiar inverse to national wealth, it would seem the thirder the world, the better the public transport (Auckland, I’m looking at you - sort yourself out). Around Taytay, the place we are living in, you don’t walk far before some kindly trike driver beep-beeps you with a friendly smile to see if you need a lift anywhere. Usually they sing out hopefully “SM?” – pale faces equal a need for airconditioning... local Super Mall anyone? The drivers are, of course, usually right, but sometimes we wave them on just because we don’t like to be stereotyped. <sigh> #small victories. 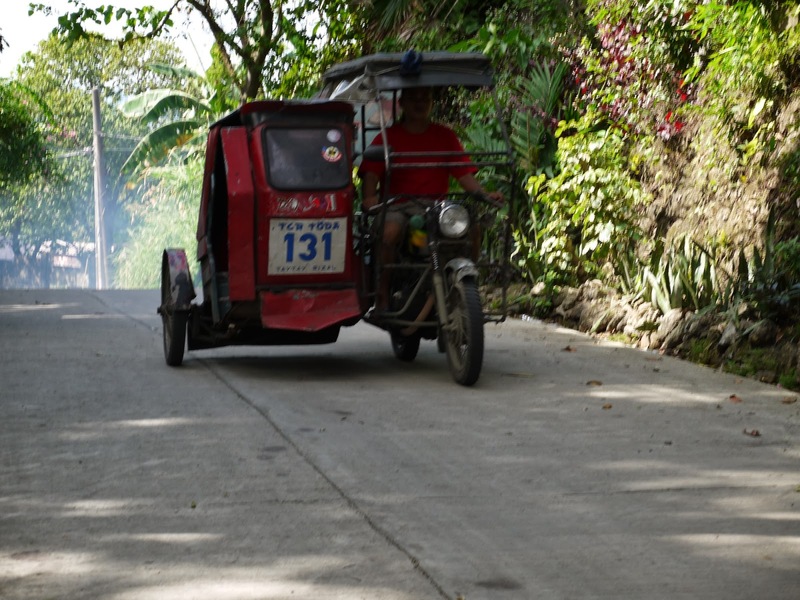 Typical trike zipping up the hill - smoke an optional extra. At around 40 peso ($1.10) for the trip down the hill and into town (grrr, yes, I mean the mall) it’s a speedy and cheap way to get around. But let me tell you about the alternative. 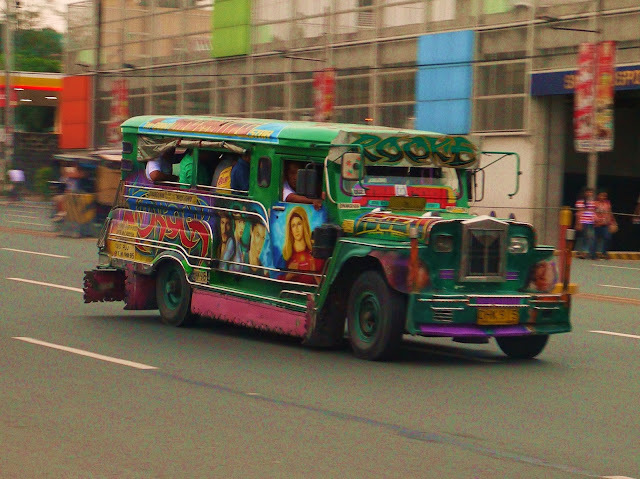 Jeepneys are honestly the most incredible public transport system I have ever seen. Let me paint the picture - part WW2 jeep, part bus, part mobile street art, these vehicles seat about 20 passengers on two long benches in the back and a driver and sometimes an assistant up front. The driver is pretty serious and doesn’t talk much, but has wads of 10 and 20 peso notes folded neatly between each finger resembling a sort of money fan. The ‘hailer' hangs out the window yelling for business, calling out the destinations and encouraging people to jump on board. 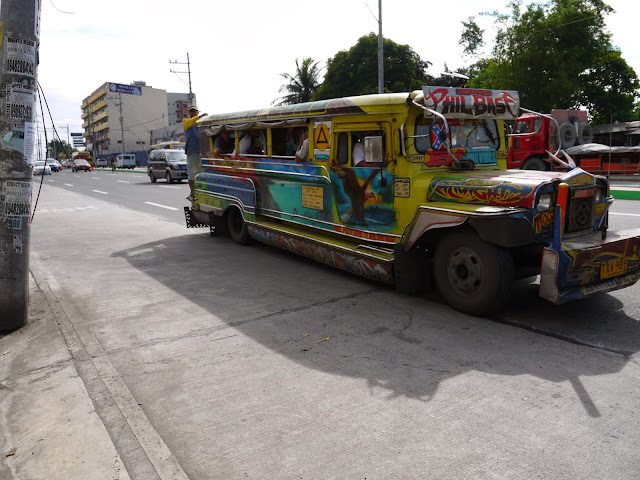 The jeepney tends to go nowhere until it is pretty much full, and the hailer keeps a count of how many bums-on-benchseast, calling on people to shuffle along to make room for one more. 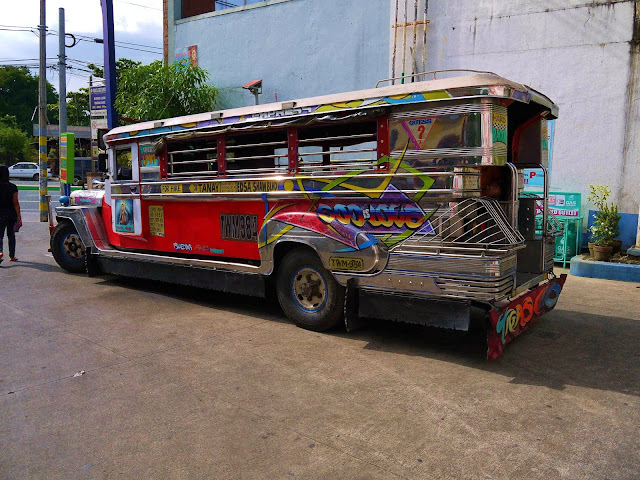 As a Jeepney passenger one requires upper body agility and strength, because the roof is so low you bend double to find your space on the seat. 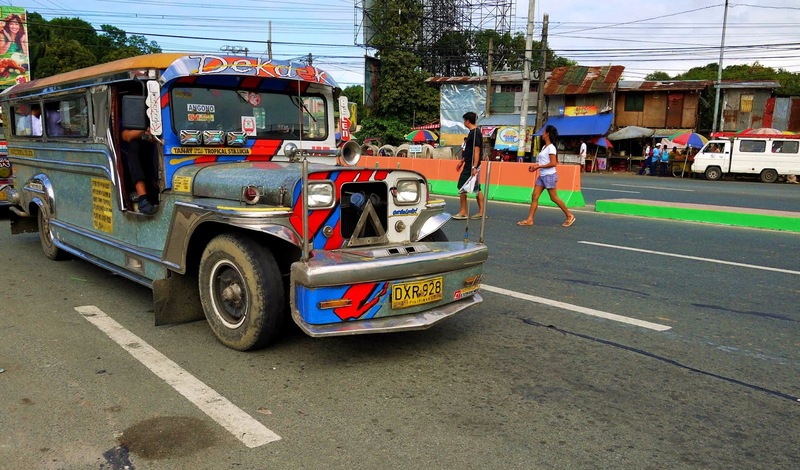 By night, Jeepneys really come into their own. There are no awkward silences on a Jeepney, because now the hailer has an additional job - sound system control. Most of the jeepneys are kitted out with massive speakers and American pop music is top of the playlist. You want more? 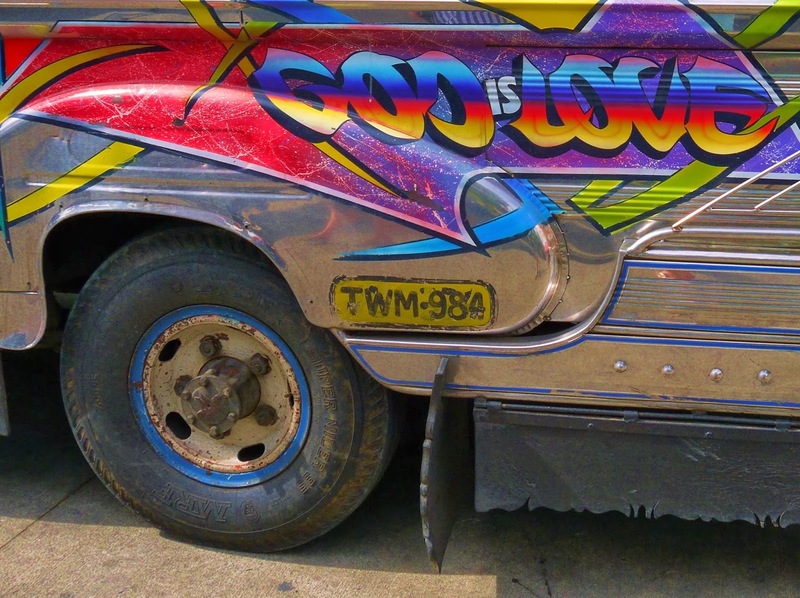 No problem – the jeepney will throw in some neon lights for good measure. One had a mirror ball hanging over the driver, as well as assorted glowing skulls grinning from the dashboard. Let me tell you, 20 teeny Filipino passengers, 2 larger kiwi bottoms and assorted packages crammed into a small space with booming rap music and strobe lighting makes for an interesting mobile nightclub. We wondered what the extra ‘ping-ping-ping-ping’ noise was a various intervals one night – realising later that it was passengers smashing a coin onto the metal handrail to signal they wanted the driver to stop. Because calling out for a stop would be ridiculous – the music, remember? It’s crazy, hilarious and so very Philippines. All this entertainment for a measly 8 peso (25cents)? Don’t mind if I do! Let me tell you about Rose. I met her at antentatal clinic a few weeks ago. She struck me as a bright and bubbly 16-year-old who could have as easily been browsing a Hello Kitty catalogue as having a baby, and yet she seemed to be taking it all in her stride. Her tummy was perfectly round; one of those 'basketball' pregnancies - not an ounce of extra weight and a tight, compact belly poking out the front. When I got a text to come up to a birth it was just after 1am and I was in that delicious almost-asleep phase after tossing and turning for a couple of hours in the heat. I was glad to glimpse Rose's face beyond the labour room door - I got a quick smile of recognition before her next contraction hit. For the next half hour I monitored her contractions - they were short, snappy little suckers coming frequently. Rose was pacing, pacing, pacing. Lunging. Rocking. Squatting up and down. Her back hurt - but she was taking care of it - massaging up and down her lower back herself while she walked round the room. Midwife means 'with woman', and I did my best. Rose was hard to keep up with and I offered several times to give her arms a break by rubbing her back for her. "Its OK" she would pant out, pumping her arms up and down her sacrum. After an hour, my arms were aching just watching her. "Rose", I said, "please let me help you, even for just one contraction..."
"It's OK. It's Ok. It's OK"
I didn't feel OK. I felt conflicted - watching this young woman labour on her own - her partner hadn't responded to her midnight texts. I wanted to help, to be there for her physically as well as emotionally. My mind flicked home, rolodexing through the other teen mums whose labours I had attended. They had a distinct commonality - big hospital, big drama, big-gun pain relief. Fed with a diet of television birthing those young women had seen birth through television eyes and - unsurprisingly - their own experiences were mirroring those pictures. Her birthing was guided not by layers of visual, but an internal compass that told her to move, move, move. Keep busy. Rub. Walk. Get on with it. She named her little girl Princess. A teeny dot of a baby that I passed up into Rose's tired arms. I checked Rose afterwards, and was disappointed to find she had had a tiny tear as Princess had been born. I felt like I had let Rose down; like guarding her perineum was my only real job to do and I hadn't done her justice. It didn't matter that the midwife told me I had done everything right and the tear was almost inevitable, I had so wanted that final part of the birth to go perfectly too. Later in the day, Rose's friends came to visit her. She had sent out a group text to announce little Princess's arrival - some things are the same the world over, right? I glanced up from the book I was reading on the porch to see Princess's daddy cradling her like an armfull of eggshells, surrounded by their friends. While earlier he had been scared to hold her, now his confidence was growing as he proudly showed off his little Princess. Today was antenatal clinic day. It’s a hustle-bustle kind of morning – lots and lots of women arrive over the course of a few hours, and we work through taking blood pressures, weighing, and blood testing for haemoglobin levels before we measure their tummies and listen to the baby’s heartbeat. Clinics this busy run well with teamwork – we set up stations and break the antenatal appointments into tasks – one midwife on each job. It’s not the continuity of care that we practice in NZ, but it’s necessary, and it works. The women chat to each other and there is laughter chorusing around the room as they wait in line. Finally, a break in our day as the lines peter out and the women congregate outside to enjoy some street food and collect their toddlers from the playground. We head over to The Little Children’s Home for some cuddle time. It’s a dry, cloudy day and the heavy humidity makes it feel like we could see some rain in the next little while, but we have plans to take some babies out for a walk today, so clouds or no clouds, we scoop up a wee person each and head outside. These kids don’t get sunlight too often. The little guy I’m carrying screws his eyes up as soon as I step outside and blink-blink-blinks against the daylight. His little arms flail a bit and I use my hand to shield his eyes while he adjusts. Walking up the road we get some stares, but we don’t care. Yes we are white girls carrying Filipino babies in our arms... stare away! Soon some of the neighbourhood kids are following us – they are laughing and giggling to each other as they skip along. We aren’t sure if it’s at us or the babies who are squealing with glee when they get close – but it’s all good-natured so we keep plodding along. We pass under some trees, and the little guy I’m carrying seems fascinated by them swaying in the breeze. I stop for a bit – enjoying his wonder-filled face. Is it just being outside? Or perhaps it’s being able to see bigger, wider, taller than the walls of the nursery room. His chubby little legs are pumping up and down with excitement – I change my hold on him because my arms are getting tired with all the energy his little body is expending. ...would it have been better not to visit at all than to give them that little taste of the wider world? We sneak away when all is calm. The TLC nursery carer gives us a smile and a nod and we walk back up the staircase and out into sunshine. Being taller is well documented as being an advantage in life. Perhaps having people always looking up to you gives you a constant psychological boost? Of course, sometimes the opposite is true. I can recall several girls I knew growing up (literally) whose hormones kicked in sooner than the rest of us who towered over all the other girls and boys in class. In an effort to fit in better, they would hunch their shoulders in and hang their heads lower. Being tall made you stick out – I wonder if as adult women their height has become an asset. If our physical position impacts on our view of the world, both what we see and what we feel, what does this mean for me as a midwife? The women in our care often end up lower than us. We stand over them to measure their tummies, to do an examination, and often, to assist at their births. Sit down. Lie down. And while I do my work, I stand over you. I’m the professional/you’re the patient. (I know more/you know less?) I’m not intentionally doing this; it’s just the way it is. It’s socially constructed: I’m a student midwife and we generally do what we see... so the system replicates, ad infinitum. So finally, I get to the crux of this post: birthing stools. I’ve talked about them before, and I must be honest, when I first saw them in constant use in the birthing room, I was sceptical. Were they just a default – like birthing on our backs on a hospital bed back home? But believe me, I’m a convert. Right now some Filipino craftsman is carving me one out of native mahogany and I will give away possessions until my bag is under the weight limit so I can bring it home! Here’s the deal. Using the birthing stool, as the woman labours, and we sit at her feet. It flips my ‘normal’ on its head. She is high, we are low. In this male-dominant society, birthing may afford her the only opportunity to demonstrate power. So, on this stool, this temporary throne, she sits in the dominant position – and calls on her unique power to bring forth new life. Because we are here to serve you. I’m just back from assisting at a first-time mama’s birth – she had worked hard all night and I joined them just after sunrise as she was nearing full dilatation. The room was peaceful, the woman resting on the bed with her husband at her side giving backrubs during contractions. Her mother came and went from the room – she seemed to be finding it hard to watch her daughter in pain, but wanted to help as much as she could as well. As the labour progressed, the woman found it hard to get comfortable – on and off the birth stool, up and down from the floor, using lunging and rocking to help her baby move into the best position to traverse his way to birth. It seems rare to see intimate moments between husband and wife during labour – but this couple were swaying together in a labour dance of love and support. It was a classic ‘transition time’ – working hard for that last centimetre or so of dilation. On the little baby came; after a slow and gentle descent he made a run for home and came out all of a rush – head, shoulders, body all in one fluid motion. He was a little stunned at first, but soon enough filled his lungs with air and the room with sound. Mama looked amazed; she radiated the proud “I did it!” glow that always makes my heart fill with emotion. She tucked into bed with her baby on her chest, we sat opposite her filling out the paperwork. The highlight of this birth? Not the beautiful baby, the radiant mother or even the resounding “thank you Lord” that we all uttered after the baby made his speedy final rush to the light. Following a birth here the fathers always provide some simple food for their wife – usually it’s instant cup-noodles or perhaps some sweet bread. But this daddy slips away and spends his hard-won peso not only on 2-minute noodles, but also on a simple plastic tray – the kind of bright-coloured shallow container we might keep in the bathroom cupboard. Onto this tray he arranges the pot-noodles, water glass, and plain paper napkin like a five-star meal. And then he presents it to her as if she were a queen holding the heir to the throne, accompanying it with the most beautiful look of love and respect. A simple meal, a simple gift, for a most extraordinary moment in their lives. Outside my window, it’s hot. 31degrees and high, high humidity following a short blast of rain. I’m lying on my bed with the window open, and the electric fan on full-bore to try to shift some of the glutenous air around the room. I don’t think I’ve felt any natural breeze here at all, only those generated by hard-working oscillating fans. Even in the poorest of homes, you will find an electric fan – without one the humid heat smothers you like a blanket. A couple of dogs flit past. With my angle on the bed I only see only a flurry of legs but I know these guys nonetheless. There’s a gang of strays that roam the streets around the birthing home; probably all related given the colourings and size. There’s a pregnant mama amongst them, she’s slower than the rest and can often be seen tongue-lolling, sitting at the door of the birthing home. Perhaps she is waiting for a check up? Outside my window I hear distinct ‘chirp-chirp’ that is becoming a familiar sound. I glance up and see a small yellow gecko creeping across the window mesh. The windows here are not just glass like at home, they have an exterior metal grill with mesh inside to prevent mosquitoes and provide security in a country where open windows are a necessity except during rain showers. The gecko stops wiggling for a minute and I try to sneak up for a closer look – I’ve yet to capture one in a photo – but he runs away before we get eye to eye. Shame, I’ve come to love these little guys; they are often seen inside the birthing home snaking across the labour room ceilings. I roll over and try to concentrate on my book. I’ve read this paragraph at least three times now but only seem to realise it once I’m well into the second sentence. Not that it isn’t a great book – but the heat is slowing my brain and my concentration. I feel sleepy, so drop the book on the floor and close my eyes. I’m just drifting off when I hear children singing “Happy Birthday To You, Happy Birthday To You...”. How sweet! My brain catches up again. We hear this song often drifting out of the orphanage – it works like a wake-up alarm many mornings. The law of averages tells me there is little chance there are actually that many birthdays close together at the orphanage, so I’ve decided it’s just an English song the kids know the words to. The little voices are so cute as they sing with all that toddler exuberance, then with a crash, someone has thrown something and the voices die down as the culprit is chided and the victim’s tears are shushed by one of the caregivers. Outside my window I see one of the neighbourhood cats slowly skulking down the stairs - perhaps it was startled by all that noise circling above? Every cat I've seen so far has been skin and bone - SPCA material back home. They even move differently. It’s like each step is a labour, a carefully weighed up cost-benefit analysis of energy expended for food gathered. And I have yet to see one with a full length tail – they are twisted, knotted, stumpy things surely no cat could be proud of. In fairness, I am impressed that these guys are even surviving – they belong to no-one and get by on scraps chanced from the rubbish. We put out our food scraps behind the apartment each evening, and it is all gone by morning. Last night we saw a mama-cat hungrily gobble our chicken bones, and then carry a piece to the corner of the garden and leave it there... sure enough a tiny kitten popped her head through the fence and slowly savoured that little morsel. How these cats survive, never mind carry kittens and raise them is beyond me. I close the windows – shutting out the busyness. I’m tired after a long night assisting at a birth so I’m going to use the heat as a sleeping pill.